The Children of the Gospel Choir performed on From the Top with Host Christopher O’Riley Show 296, recorded October 2014. 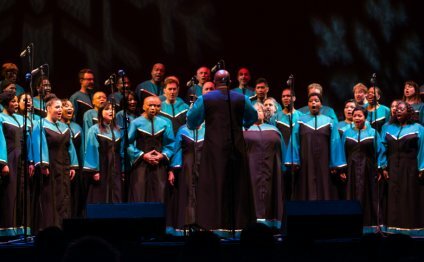 The Washington Performing Arts’ Children of the Gospel Choir was formed in Washington, D.C. in 1993 to celebrate the tradition and inspirational root of gospel music on America’s main stages. It showcases uniquely talented young voices in their own distinctive style of high energy performances featuring works by local and national composers. Led by artistic director, Stanley J. Thurston and music director, Michele Fowlin, the group has been featured at The White House, the Inaugural Prayer Services for President Barack Obama at the National Cathedral, the State Department, the National Archives, the National Cherry Blossom Parade, the Smithsonian Museums, the Harman Center for the Arts, the Kennedy Center’s Millennium Stage, and NBC’s Today. The Washington Performing Arts gospel program promotes an environment of self-confidence, teamwork, and respect.